David Powers King: 4th Writers' Platform-Building Campaign! It's that time again - time for the 4th Writers' Platform-Building Campaign, hosted by none other than the amazing Rachael Harrie! This time, it will be a mini-Campaign that will run from now until Saturday, March 17, 2012. Hurry and sign up here before Feb 15th. There is no cooler way to meet follow bloggers and share your writing (with some awesome prizes - some of which I'm donating)! Follow the rules, spread the word, and you're set! I'm David, and bring on the awesomeness! Hi David. Love your blog - makes me smile. I'm excited to be in the campaign with you. I like SciFi/Fantasy as well - even did Orson Scott Card's literary bootcamp a while back. Too much happening now with my book release and the A to Z Challenge approaching. Think that's all the activity my blog can handle at the moment! Cool, David, thanks for posting about this. I think I might go ahead and get involved! Stopping by from the campaign to say hi. Enjoyed your post on weapons. I'm in! Can't wait for the fun. This is my first campaign. I've happened upon some of your comments elsewhere, and I like your sense of humor. Even though we're not in the same groups, I decided to check out your blog. This sounds like so much fun! I have to sign up this weekend, though, but I will. Looking forward to it, and really glad you posted on it! Hi, David. This is my second campaign. As I said on my blog, the 3rd campaign really helped me launch my "platform." Now, maybe it can help sell books! I like s/f and fantasy as well, but these days, I'm looking for something that's different from most s/f. Hey, David! Nice to meet you! Thanks for stopping by my blog. Hi ya, David. Looks like we already have something in common--our last name! Great one at that, eh? Well, I'm one of the campaign members. I'm excited to get to know you and the others. I love authors. Love writing. Yay! 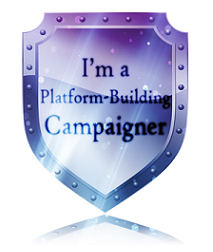 I just joined the platform building campaign and thought I would say hi. I have a soft spot for zombies too. I'm not sure where it came from but they keep popping up in all my story plots unintentionally. Stopping by to tell you how much I enjoy your blog. I've been following since the 3rd campaigner challenge. Anyway, I'm in your YA group and look forward to reading what you come up with for challenges. Hi. I'm a new campaigner, just getting around to saying Hi to everyone in the SF group. I'm a retired scientist, and my blog includes some science popularization as well as local weather (Alaska,) reviews, and writing snippets. No zombies, but I do have some telepathic dogs. Hi David, I'm in Group 2 of the Campaign and just wanted to say hello! Looking forward to the first challenge!